With the lack of available inventory, rising prices and more stringent mortgage guidelines, many buyers have chosen to abandon their search for a home and continue renting. It is a challenging market, but with incredibly low interest rates, and a bit of patience and planning, it may make financial sense to start paying your own mortgage rather than your landlord’s. A recent realtor.com article, “Top 6 Reasons to Not Buy a Home – Debunked” listed the most common reasons people don’t buy a home and the reality checks showing why that goal might be within reach. #1 I don’t have enough for a down payment – In reality, few buyers purchase a home with 20% down. There are great FHA and conventional loan programs available for first time buyers with 3% to 5% down payments. Grants are another option for subsidizing a down payment. These typically require taking a home ownership course. Just remember, if you put less down, you’ll need private mortgage insurance (PMI). #2 I can’t afford a mortgage payment – Monthly rents in the Seattle/Bellevue areas can approach or exceed a typical mortgage payment. There are rent vs. buy calculators available online to help you determine if renting or buying makes more sense, especially if you plan to stay in a home for several years. #3 I don’t have a good enough credit history – You don’t need a 750+ credit score to qualify for a mortgage. Review your credit reports to be sure they’re correct, dispute any errors (this can take 60-90 days) and over the next 2-4 months make an effort to pay down credit cards and clean up your credit picture. If you don’t qualify for a mortgage now, that picture could change for the positive in less than six months. #4 I don’t have any credit history – You can build credit history without a credit card. If you rent, provide verification that your rent payments have been on time (bank statements, a statement from your landlord); do the same for utility bills. #5 I haven’t been at my job long enough – While work history is important, even if you’ve recently changed jobs you can still qualify for a mortgage, especially if your new job is in the same field and income range. If you’ve changed careers, a letter from your place of employment could help in confirming your job stability and growth potential. #6 I can’t find a home I like in my price range – This could be the biggest obstacle facing buyers, especially first time buyers. Be realistic – don’t try to buy your last home first. You should find a condo or house that feels like “home”, but this will likely be the first home of two, three or more over the next several decades. You can move up to eventually buy your last or dream home. While I acknowledge many people see rats as great pets (my son had a pet rat when he was young – Rodney was very smart) rats and other rodents can be a problem in urban areas. Restaurant and residential dumpsters along with city parks and open spaces, provide ample dining and nesting opportunities for urban wildlife – rats, bunnies, raccoons and even the occasional coyote. Urban wildlife should come as no surprise in any city. Their fear of humans has lessened over the years as development has encroached on their habitat. Cities and local health departments do their best to manage the health and sanitation issues and damage rodents can cause, but “it takes a village” to manage the problem. Along with restaurants and hotels, urban condominium communities need procedures for keeping garbage areas clean and emptied regularly and budget for a pest control plan. HOAs may need to implement restrictions for bird feeders (rats love bird seed and can climb an exterior wall to reach a feeder on an upper level deck) or feeding pets outdoors. Eliminating the the food source will go a long way in reducing the rodent problem. Outside your home, common sense/courtesy should prevail – in a park or other public area put litter in a trash container. That biodegradable apple core you toss on the ground because it will “go back to nature” will attract rodents of all sizes in a nano-second . The Seattle Kennel Club’s annual dog show was last weekend, an event I never miss. Its fascinating to see a building full of hundreds dogs and the wide variety of size, shape, color and coat that can be found. Seattle MINI, one of the show’s major sponsors, had an exhibit with several models on display demonstrating the vehicle’s dog and owner friendly features. I don’t know how many sales MINI generates from the dog show, but with a captive audience of dog owners, breeders, trainers, handlers, judges, etc., its probably a worthwhile marketing effort. Seattle MINI is coming to Bellevue . . . Seattle MINI and The Bellevue Collection have announced a satellite showroom will open this spring at Bellevue Square. The urban micro showroom will have over a dozen vehicles available to test drive and MINI merchandise and accessories will be available for purchase. This is a new dealership concept for MINI and the Bellevue Square Seattle MINI will be the first satellite store in the nation. It might be fun, with a captive audience of shoppers, to see how many Bellevue Collection shopping bags it takes to fill the back of a MINI. If you live or work in downtown Bellevue, no doubt you know how much the city has changed in the last decade. 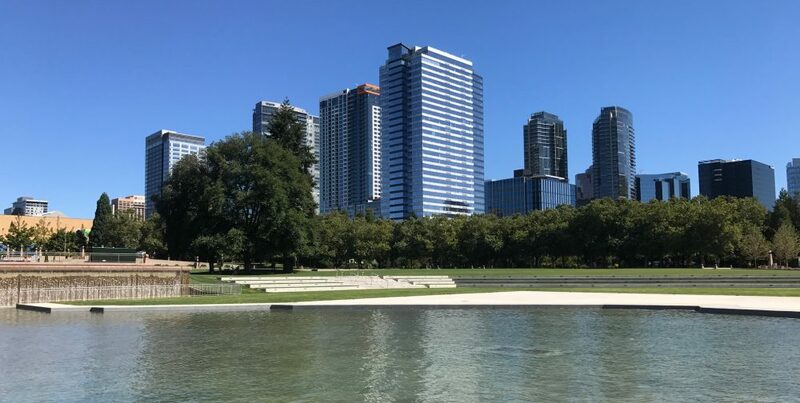 While not everyone is a fan of change, we are fortunate that Downtown Bellevue not only survived but thrived during the last economic downtown, evolving into a thriving central business district home to national and international corporate headquarters. Nearly 12,000 people currently live downtown, and that number increases every year, it the city’s fastest growing neighborhood. Congratulations to Downtown Bellevue which recently made Livability’s list of Top 10 Downtowns. The city has diverse appeal offering single family, mid rise and high rise housing options, world class shopping and dining, a thriving arts and entertainment scene, fabulous urban and lakefront parks, dozens of coffee shops and nationally recognized schools. Its a level, easily walkable, pedestrian friendly city. Its a great place to live and a great place to call home. Ben & Jerry’s, known for its unique ice cream flavors and creative names, is coming to Bellevue (can’t wait!). Scheduled to open at Bellevue Square in April , Ben and Jerry’s will occupy space on the first level across from McDonald’s on the first level (previously occupied by Baskin & Robbins). An ice cream lover, I’m a frequent visitor to the Kirkland shop, justifying the calorie intake by walking around downtown Kirkland with my Ben & Jerry’s ice cream cone. Looking forward to having one of my favorite ice cream vendors in downtown Bellevue soon and counting the laps I’ll need to walk around the Downtown Park to justify the calorie intake.